If God can't, who can? NASA has finally conceded that the Opportunity rover on Mars is a lost cause. Contact was lost last summer when a massive Martian dust storm forced Oppy, as it is affectionately known, to shut down. Opportunity was solar powered so the dust basically prevented it from generating enough energy to keep going. The good news is that Opportunity vastly outlived its expected lifespan. The original mission was to last 90 days and ended up clocking 15 years. And it collected tons of data about the red planet in that time. IOW, it more than did its job. And the younger Curiosity is still going strong. Unlike Opportunity, it's nuclear powered so the dust storms are just a minor obstacle for it. And new rovers are planned for the near future. Then there are Irish Rovers as things roaming through that dark place unobserved as opportunities lost. The one has to understand that Eire stands for an isolated place and also, in ancient celtic, as psyche ... a separate state of mind from imperialism? Brute force one ... second thought went subtle and partisanly underground and why we have vociferous nature! Few can hear it either. 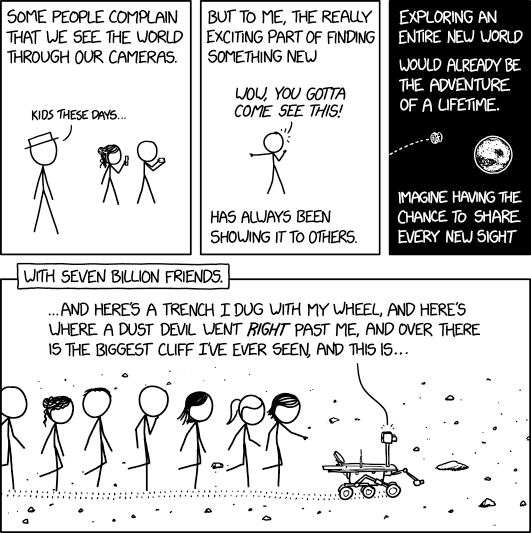 xkcd's tribute to Opportunity (Randall Munroe, the cartoonist/writer, worked for NASA so space stuff is near and dear for him). The end of Opportunity will be just that - the end of Opportunity. The good news for us humans is that we can be on a different path. Before our battery dies out, we can be given faith by God - either through baptism or through listening to God's word being preached. Are gods rough pantheons when lined up? Can one line up a god or their following considering the corruptness that goes with such power? --- Lord Acton!